It is good that you love your family. You should love your family. I am sure your relatives are lovely people, and you enjoy their company, and would be worse off without them. But by the same token, I am grateful for the fact that I have never had polio, smallpox, or Ebola. I am thankful that I did not die in childbirth (my own or my childrens’.) I am thankful for life-saving surgeries, medications, and mass-vaccination campaigns that have massively reduced the quantity of human suffering, and I happily praise the doctors and scientists who made all of this possible. That is why doctors and scientists are higher status than dumb people, and why math-smart people (who tend to end up in science) believe that they should have more status than verbal-smart people. The obvious answer is no, people don’t only care about intelligence in the context of making money. People also care about enjoying music and reading good books and having fun with their friends, having pleasant conversations and not dying of cancer. But people are practical creatures, and their first priority is making sure that they and their children will eat tomorrow. In a purely meritocratic society, more intelligent people will tend to end up in professions that require more intellect and more years of training, which will in turn allow them to demand higher wages. (So will people with rare physical talents, like athleticism and musical ability.) Unintelligent people, by contrast, will end up in the jobs that require the least thought and least training, where they will soon be replaced by robots. The incentive to pay your doctor more than your trash collector is obvious. The truly bright and creative, of course, will go beyond merely being employed and actually start companies, invent products/processes, and generally reshape the world around them, all of which results in making even more money. The truly dull, by contrast, even when they can get jobs, tend to be impulsive and bad at planning, which results in the loss of what little money they have. 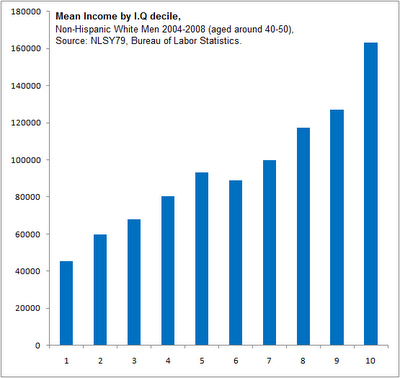 We do not live in a purely meritocratic society. No one does. We make efforts to that end, though, which is why public schools exist and employers are officially not supposed to consider things like race and gender when hiring people. Which means that our society is pretty close to meritocratic. There are a few outliers–the gulf oil states are far richer than their IQs would predict, due to oil; China is poorer than its IQ predicts, which may be due to the lingering effects of communism or due to some quirk in the nature of Chinese intelligence (either way, I expect a very China-dominant future)–but otherwise, IQ predicts average per cap GDP quite well. 1. I know a guy who is smart but poor, and a guy who is dumb but rich! Two anecdotes are totally sufficient to completely disprove a general trend calculated from millions of data points. Yes, obviously some really smart people have no desire to go into high-paying fields, and devote their lives to art, music, volunteering with the poor, raising children, or just chilling with their friends. Some smart people have health problems, are unfairly discriminated against, live in areas with few jobs, or are otherwise unable to reach their potentials. Some dumb people luck into wealth or a high-paying job. It would be a strange world indeed if IQ were absolute destiny. But the existence of outliers does not negate the overall trends–smarter people tend to get jobs in higher-paying fields and manage their money more effectively; dumb people tend to get jobs in lower-paying fields and manage their money ineffectively. Either we mean something when we say “intelligence,” or we do not. If we want to define “intelligence” so that everyone is equally smart, then yes, everyone is equally smart. If we want to know if some people are better than others at doing math, then we find that some people are better than others at doing math. Are some people better than others at reading? Yes. Are some people better than others at football? Yes. If you transported me tomorrow to a hunter-gatherer community, and they gave me a test of the skills necessary for survival there, I’d flunk (and die.) They’d conclude that I was an idiot who couldn’t gather her way out of a paper bag. But neither of us lives in a hunter-gatherer society, nor do we particularly care about the skills necessary to survive in one. 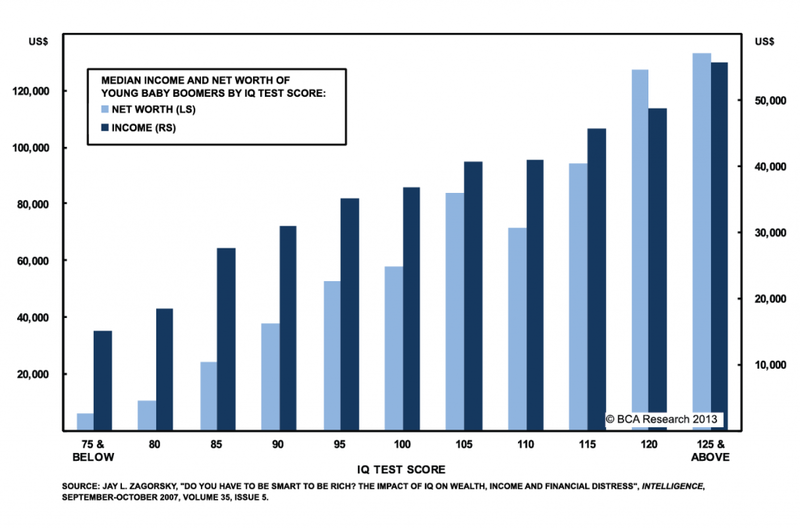 If I want to know the kinds of intelligence that are necessary for success in industrial societies–the kind of success that may have led to the existence of industrial societies–then you’re looking at normal old “intelligence” as people conventionally use the term, measured by IQ scores, the SAT, vague impressions, or report cards. Luckily for us, we have adoption studies. In other words, adopted kids end up with the IQ scores you’d predict from looking at their biological parents, not their legal parents. Baring extremes of poverty or abuse, the way your parents raise you–including the quality of the schools you attend–has very little long-term effect on IQ. IQ doesn’t lend itself to much environmental manipulation – indeed, interventions that attempt to boost IQ have all met with failure. As well, IQ remains predictive even when measured in youth. It is predictive even when one controls for things like socioeconomic status (say during childhood). Indeed, the best control for this, looking at different siblings within a family, finds that IQ is predictive of real world outcomes between siblings – the sibling with the higher IQ tends to do better. These are in addition to the fact that there are visible physiological correlates with IQ, such as head and brain size, as well various anatomical features of the brain, such as cortical thickness (Pietschnig et al, 2014, Shaw et al, 2006, Menary et al, 2013, Karama, Deary, et al, 2011). Indeed, a recent research team found that they were able to accurately gauge IQ from brain MRI imagery alone (correlation of 0.72 between prediction based on imagery and test-measured IQ – Wang et al, 2015 – see also Steve Hsu, Information Processing: IQ prediction from structural MRI). 4. Your map is racist. That’s the million dollar objection, isn’t it? Everybody wants to know why some groups or countries out perform other groups or countries, but no one likes to be told that they–or a group that they belong to–are less intelligent than others. No one wants to be in the red; everyone wants to blame their troubles on someone else. Thus a great deal of debate; some people want to prove that the wealth and poverty of nations depends on IQ, and some people want to prove that it does not. No matter your personal opinions on the matter, it’s pretty hard to have a discussions about IQ without the debate resurfacing. Regardless, a certain kind of intelligence appears to be useful for building certain kinds of societies. Yes, there are lots of reasons to value intelligence, like making art and enjoying a good book. And there are many lifestyles that people enjoy that do not require making lots of money, nor do they have much to do with capitalism. 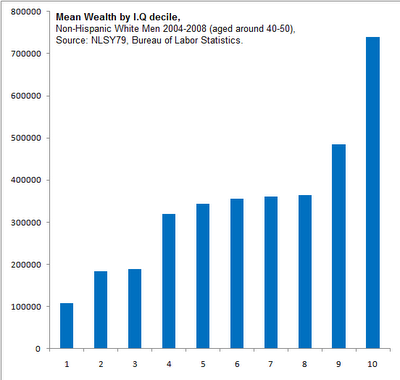 But there exists, nonetheless, a fairly reliable correlation–at the group level–between average IQ and income/wealth/development level. Most people don’t care about this because they want to exploit each other and destroy the environment, but because they want to be well-fed, healthy, and happy. Yep, IQ only matters under capitalism. Under communism, intelligence matters barely at all. No matter how clever you are, you will probably be poor. Your intellectual abilities might get you a relatively good job, but they are just as likely to get you in trouble. In properly functioning communism (haha, I know) smart people would be shunted into jobs where they are of most benefit to the community. So even communists ought to value intelligence. There are, of course, also pre-capitalist sorts of economies. Yeah, they would have to value it, but would they reward it? A strict Marxist system would not reward high productivity, I think, though this would probably undermine productivity on the long term. And, iirc, the ussr was really into its chess champions. Communism doesn’t count status points in monetary units. This explains why much of America can be credibly considered communist today. IQ pressure on Han Chinese, Ashkenazim, etc. was not due to capitalism, but status competitions in arenas that correlate with g.
Askenazim probably had a head start due to cultural preference for spouses who can read, but other Jewish groups don’t match their IQ, which suggests to me the influence/interaction of something local to the East European environment–which I suspect was emerging capitalism. I wonder how much of a difference intelligence makes in hunter-gatherer and agricultural societies. Dumb hunter gatherers probably have a harder time tracking animals and finding plants than smarter ones, but there is also probably only so much use for intelligence in the HG context. Some HG languages don’t have words for numbers bigger than three; they have ways of reckoning larger quantities, like one-to-one correspondence with body parts, but they don’t really do or have any use for math. And intelligence is expensive–calorically, maternal death wise, and the longer period of infant helplessness. 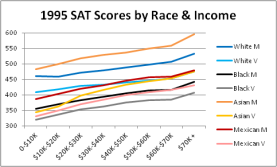 True in the US, but when you look at scores on a similar standardized test in the UK (the GCSE, mostly taken at ages 15-16) you find only a very small gap between black and white students, and in fact the lower-income black students (the ones who qualify for free meals) outperform the lower-income white students. See http://www.theguardian.com/news/datablog/2010/oct/11/how-fair-is-britain-data along with the article “The IQ Gap is No Longer a Black and White Issue” at http://www.unz.com/article/the-iq-gap-is-no-longer-a-black-and-white-issue/ for additional information about black academic achievement in the UK (and the followup article at http://www.unz.com/article/closing-the-black-white-iq-gap-debate-part-i/ also makes the point that you don’t see regression to the mean among the children of African immigrants, suggesting it’s not just a matter of immigrants being genetic outliers relative to the African populations they come from). The children of Brahmins don’t regress to the Indian mean, either. The notion that entire countries (or worse, entire continents) possess a single breeding population with no tribal, ethnic, or class divisions is silly. Immigration is difficult; it would be very odd to find that the process managed not to select for anything, not even determination to succeed. 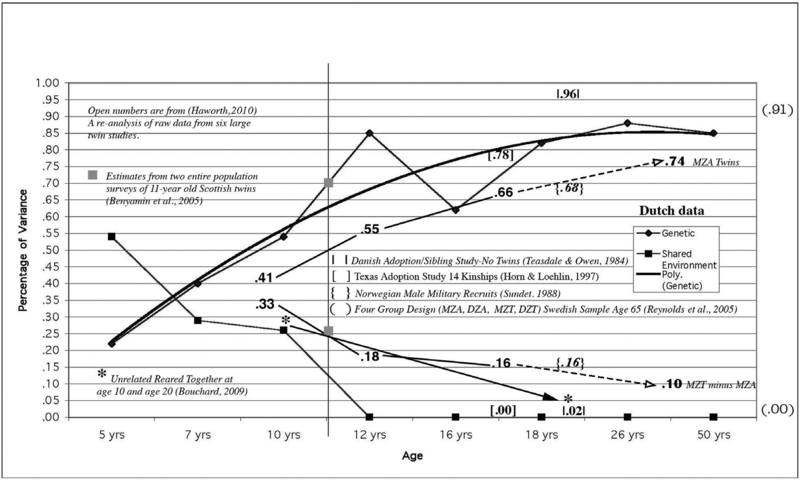 Of course children don’t regress to the mean of the entire country they come from, but they do regress to the mean of their parent’s families, not just the mean of their parents individually (as explained in jaymans’ article at http://www.unz.com/jman/regression-to-the-mean/ ). So are you hypothesizing that African immigrants to the UK not only have IQs similar to white UK citizens, but that they also fairly consistently come from families where the average for the whole family is equally high, and they also consistently select spouses that come from equally high-IQ families as well? This would seem to imply that most African immigrants come from distinct ethnic groups with average IQs similar to white UK citizens, and that people from these ethnic groups tend to only marry within the group (akin to Brahmins in India). Can you point to any evidence there are such distinct high-IQ ethnic groups in Africa, and that the majority of immigrants come from such groups? Surely it wouldn’t be that hard to identify such a pattern if it were true. So are you hypothesizing that African immigrants to the UK not only have IQs similar to white UK citizens, but that they also fairly consistently come from families where the average for the whole family is equally high, and they also consistently select spouses that come from equally high-IQ families as well? Why wouldn’t they? Why would a smart person marry a dumb person? I can look back in my own family tree and find multiple generations of people who married people similar to themselves; I’m pretty sure that most people look for mates with personalities and interests similar to their own. Who is more likely to have the resources and information necessary to immigrate: a random smart guy from an impoverished village in the hinterlands, or a literate guy from an upper/middle class, city-dwelling family, probably with connections to the old colonial administration (ie, having worked in it.) The Indonesian Muslim immigrants to the Netherlands, for example (yes, different continent, I know,) are drawn heavily from former employees of the the old Dutch Indonesian colonial administration. These folks came from high-class backgrounds, were literate, and spoke Dutch. I wouldn’t expect their kids to regress back to the Indonesian “mean,” and as far as I know, they haven’t. Can you point to any evidence there are such distinct high-IQ ethnic groups in Africa, and that the majority of immigrants come from such groups? Frost already did in the previous link, but I don’t know why you would default to assuming that there aren’t any ethnic groups with high IQs in Africa. Somali kids who don’t get proficient scores in English get shunted into ESL programs and then aren’t counted in these tests, whether they speak English as their first language or not. American blacks (and low-class British children) who aren’t good at writing English get no such special treatment. Additionally, getting asylum status in the US is no trivial matter. It’s not like someone invades your village and a UN helicopter swoops in, picks you up, and deposits you in Minnesota. The process takes years and requires tons of paperwork (and that’s assuming you can get to a refugee camp and survive.) I wouldn’t assume that Somali refugees are reflective of the Somali population at large; at the very least, they are likely to be extremely dedicated and determined people. Sure, but the point is about moderate statistical differences between people and their partners/parents, not about people having hugely different IQs from their spouses/partners. The fact that a “smart” (well above-average IQ) person isn’t likely to marry a “dumb” (well below-average IQ) person isn’t inconsistent with the hypothesis that people who are significantly above average relative to their mating pool (the people they are likely to meet socially and are not immediately ruled out as potential mates based on obvious dividers like ethnicity, class, etc.) are likely to marry people who are somewhat closer to average than themselves (even if still above average). Likewise, your statement isn’t inconsistent with the hypothesis that if a person is significantly above average for their overall ethnic group and class, the average of their parents’ IQ is likely to be somewhat closer to average than their own. Unfortunately my limited googling doesn’t turn up studies which have directly addressed this question, but wouldn’t you say it’s more plausible than not, just given the fact the fact that for any high IQ score S, we will find significantly more people in a range that’s close to that but slightly smaller (say from S-5 to S) than in a range that’s close but slightly larger (S to S+5)? It depends what you mean by “high”. My default hypothesis would be that culture and wealth play a significant role (quite possibly the sole role) in explaining why nationwide IQ scores are significantly lower in African Countries than Western and Asian ones, so the lack of any long history of literate, urban, relatively wealthy societies would mean that even though there could be some cultural variation, you probably won’t see ~100 IQ groups living in the midst of countries that are mostly in the 70s or low 80s (Lynn quotes a figure of 79 for Nigeria where the Igbo mostly come from, and HBD enthusiasts usually quote similarly low or lower figures for Sub-Saharan Africa, although the other researchers have argued that figures like these are based on unsystematic sampling and may not be representative). And even if you favor the HBD assumption that genetics rather than culture is the main determiner of IQ differences, I think something similar would still be expected, where if you look at different ethnic groups who have been in the same area (so there has been plenty of gene exchange between them) for thousands of years, one may see some variation in their genetic potential but all within a significantly narrower range than the differences in genetic potential for widely separated groups that have been isolated from one another for tens of thousands of years, like Europeans vs. Sub-Saharan Africans. Either way, Frost does not actually present any evidence that the IQ scores of the Igbo in Africa are similar to those of white people in the UK, which would be necessary to demonstrate if one wants to minimize the role of environmental differences like schooling in the UK vs. schooling in Africa and explain black UK test performances as being mostly a matter of genetics (the same also would need to be shown for the African relatives of several other immigrant groups that outperform national averages in the UK, see this chart from the Chanda Chisala article I linked to originally). Frost also makes an argument that maybe the GCSE might be badly-correlated to IQ, so the fact that African-descended people in the UK do somewhat better on average than white UK students could be compatible with the whites still having a significantly higher IQ. This seems pretty dubious to me since the GCSE is a pretty similar sort of “general knowledge of English and math” test to the SAT in the US, and we know SAT scores are very strongly correlated with IQ. (this page mentions that SAT scores correlate just as well with IQ as different IQ tests correlate with each other) The points he makes about people taking courses to try to improve their GCSE scores isn’t persuasive since we know lots of people do the same with the SAT, so this is not in itself a good reason to think the test wouldn’t be well-correlated with IQ. Also, this article discusses a study which found that 58% of the variance on GCSE scores was attributed to genetics, similar to the figure of 60-70% that’s usually been found for the variance in IQ explained by genetics. Finally, Frost presents no evidence about what fraction of blacks in the UK, or even what fraction of African immigrants with Nigerian ancestry, are actually Igbos, or members of other groups that are known to be high-achievers in Africa. 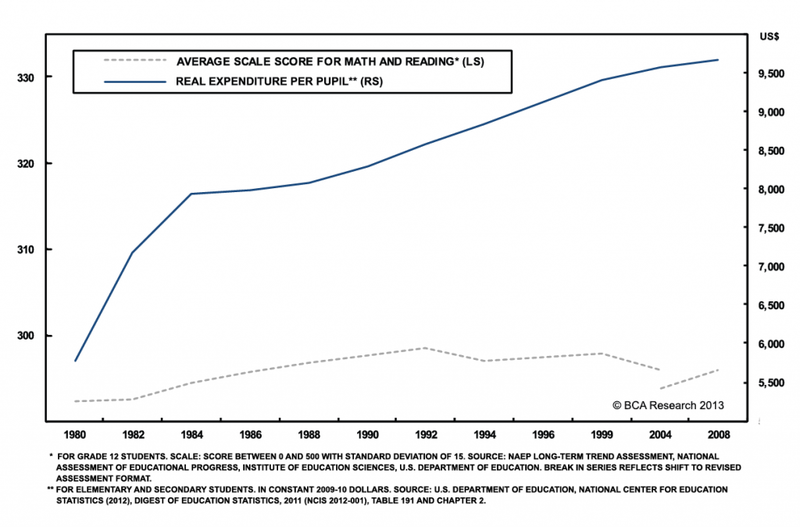 Good point, I hadn’t noticed that issue but it is mentioned in the chart about Seattle schools. But you also mention low-class British children, are you suggesting that a significant fraction of black teens in the UK are excused from the GCSE due to not learning English well enough? 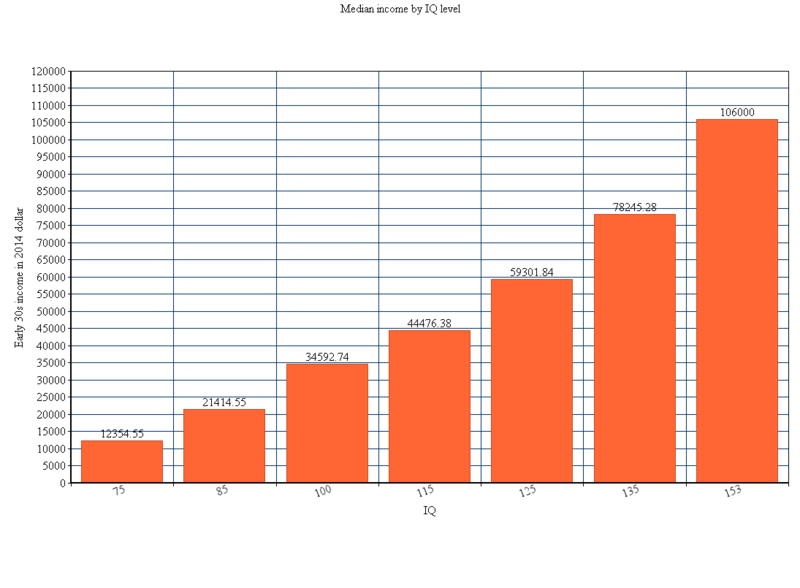 Note that the original article by Chanda Chisala I linked to has a chart showing that in 2003, Somalis scored 22.3% lower on the GCSE than the UK average, and after noting the low 2003 scores of both Somalis and Congolese Chisala argues “The low scoring African groups are the ones that migrated as refugees and/or could not speak English”, suggesting poor English skills don’t get them exempted from having to take the test. Chisala also adds that “Improvements among the Somalians have been impressive, especially due to programs dedicated to teaching them English”, and the next chart supports this, showing that from 2009 to 2011 the percentage of Somalis getting the score “5+A* – C English and Maths” (I don’t know about GCSE scoring but I assume this is good) went from 48% to 61%, the 2011 score being better than the national average of 59%. Do you have any sources that verify that’s true for typical Somali refugees? This article on Dadaab, a camp for refugees of Somalia’s war, says that the camp is “the world’s largest refugee settlement”, and it also mentions “Most of Dadaab’s residents spend their lives dreaming of winning the resettlement lottery. It is the only legal route to a normal life, but just a few hundred people are picked each year. “ Probably there’s some paperwork and background checking to do after winning the lottery just to make sure the person isn’t a terrorist or something, but it sounds like the basic selection process is random and I’d presume that if the number of winners is small the people in charge of the camp would be able to help people out with the paperwork. So if that’s representative of how most camps for refugees from Somalia operate, it would suggest there isn’t much self-selection among Somalis who make it to the US (or the UK) based on refugee status. Somali Americans have test scores very close to black Americans. I think the differences between being raised and schooled in the US or Britain vs. Nigeria or Somalia are extreme enough to add a few points on an IQ test. Might have gotten mentioned somewhere, but I believe there is a study showing economic outcomes for people who were accepted to Harvard (or Ivies, I ferget) and didn’t attend were, on average, just as good as those who did attend. But… but the magical Harvard dust! Of course, decent chance those kids just went to Stanford or Duke or Caltech or somewhere else quite prestigious instead. I know a lot of people with Ivy degrees and no money. The job market does not operate as advertized.